Emson electric-5Qt smoker is a convenient indoor pressure smoker that provides you with the opportunity of smoking your barbecue brisket as well as smoke cold cheese. This indoor smoker is a high-end appliance, which comes with good exhaust system. 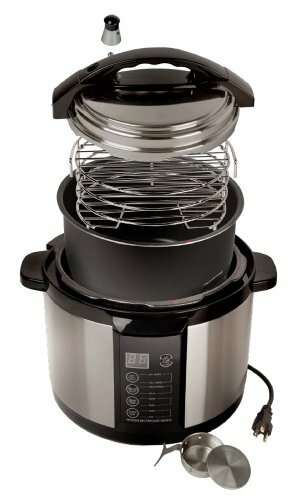 This unit has the ability of cooking up to four pounds of food per load, and the smoking time is conveniently reduced by 50%. The unit is equipped with digital settings, allowing you to easily control as well as manage the smoker’s operation. This unit has a removable drip pan, easy clean grids, and a nice tight-fitting lid that effectively seals in juices. Emson electric 5Qt-smoker is a convenient smoker choice for indoor smoking. This is particularly so for city dwellers as well as apartment dwellers who do not have a backyard to do some serious grilling/ smoking. The unit is uniquely designed to function appropriately in a closed setting without posing any threat to the person doing the smoking. Portability is a virtue for a person who does not have an open area to smoke food. This electric smoker only weighs 10.7 pounds, which makes it extremely portable for you to carry and transport. The cooking space provided by this unit is just enough for an individual or a small family setting. This provides anyone who does not have the luxury of outdoor smoking to enjoy delicious smoked barbecue right from his or her kitchen counter. This portable electric smoker combines the functionalities of a pressure cooker, along with a smoker in a single unit. This electric smoker increases its internal pressure by 15psi while cooking your food in a faster rate than the conventional smokers. As your food cooks, the wood chips are forced to disperse their aroma that penetrates through your piece of meat as it cooks slowly. For an indoor smoker, this unit needs but a maximum of five fragrance chips to instill yummier barbecue flavor onto your food. This electric smoker measures 13.2 by 13.2 by 12.6 inches, and it weighs 10.7 pounds, making it lightweight, portable and compact. Emson electric 5Qt-smoker is powered by electricity and its silver design is made up of stainless steel. The unit has a modifiable 4-level rack that conveniently accommodates up to four pounds of food. Has an easy to use digital control system, even for first timer smokers. This electric smoker is known to smoke, cook, and sears food. The unit’s power rating is a thousand watts. The smoker’s internal pressure increases significantly by 15psi. The smoker’s design is uniquely crafted for indoor smoking. This is particularly beneficial for people living in apartments, and they do not have an open area to operate outdoor smokers. The unit is equipped with digital settings, which are conveniently displayed on the side. With the digital settings, you can effectively control and manage the cooking time and cooking temperature. The unit also plugs into any given standard AC outlet. The smoker’s cooking abilities are fast when compared to other smokers. This unit cooks food rapidly; for instance, it can only take up to twenty minutes to smoke a chicken while it might take other smokers more than an hour’s time. The unit is equipped with four adjustable racks, which provide you with a cooking space of four pounds per load. You can significantly adjust the racks as you place your food. Emson electric 5Qt-smoker is not a convenient smoker choice for a person who wants to smoke more than four pounds of food per load. You should buy this product if you happen not to have adequate open area to operate an outdoor smoker. This is ideally a recommended choice for apartment dwellers. The very first thing that you should observe about this unit is the fact that it allows you to effectively as well as safely smoke a few pounds of meat indoor on your kitchen top. The smoker’s smoking capacity is relatively enough for an individual or a small family. As far as wood chips are concerned, you only need five at most. With this unit, you will have the opportunity of fast smoking; you do not need to wait for hours to get to taste the smoked chicken. This four-star electric smoker, which costs less than $100, has the capacity to ensure that you experience the taste of indoor smoking. The unit provides you with authentic smoked BBQ flavor. In a state-of-the-art stainless steel design, this electric smoker translates your desired food into restaurant-quality BBQ. You get the chance to experience both pressure cooking and smoking from a single design the moment you choose to make purchase. A feature unique to this smoker that should make you even want to buy it is its cold smoking capabilities for fish and cheese. There is more than just portability; this is the four pound food capacity smoker you seek when you want to get your piece of meat cooked in twenty minutes.